This is a thank you post. I was given the most beautiful hammer as a gift today. (Yep, I said ‘beautiful hammer’, I say stuff like that) Thank you Dave. And thank you Brad for giving the hammer to Dave! I rounded the sharp edges, polished it up, and voila, I got my egg shape! 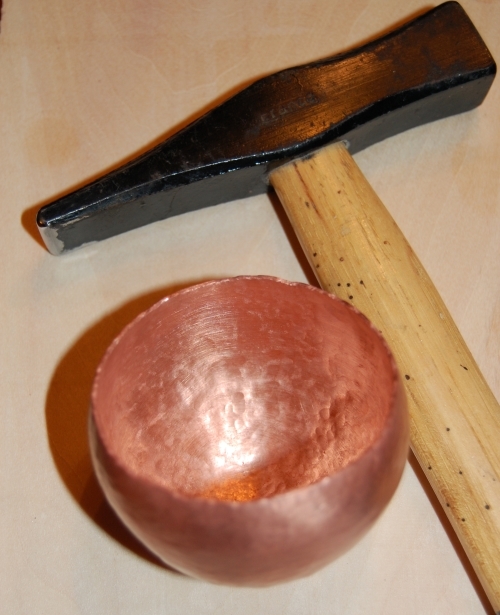 This entry was posted on July 12, 2010 at 3:23 am and is filed under Blacksmithing, Hammers, metalwork, Raising Copper. You can follow any responses to this entry through the RSS 2.0 feed. You can leave a response, or trackback from your own site. I like how the copper bowl turned out…looks great! Thanks! It still has a little work to go but I like how it looks now too. I’m also having problems getting to the egg shape. What shape stake did you use. could you describe how you got there. Sorry to ask for details but where did you hold your bowl on the stake? hammer used. etc. I don’t have time now to elaborate, but did you sink the piece first into a sandbag to get the shape started? I will try and elaborate more this evening. Thanks for the reply, Yes I did sink the vessel before the courses of raising. I used it pointing straight up out of the vise and hit a little farther away from the edge of the stake than normal, not against the stake at all. I’m a late arrival at the party as usual. This is the exact shape of bowl I’m trying to make, and I love it. But, as you say the tools needed are really expensive, and I don’t have the skills or access to a forge to make my own. I’ve trawled the web until I’m blue in the face, trying to work out how to do this – and I do have some small idea now, but in all the demos I’ve seen on Youtube, the ‘bowl’ is usually very shallow or pretty rough – they seem to start out with a ball-pein hammer and then bash most of the bumps out with a planishing hammer and call it good. Nowhere have I seen anything as remotely beautiful as this, or a shape anything like it either. It’s so frustrating to know it CAN be done, but I can’t do it! I wonder, is there any chance at all that you might be able to do an online tutorial (or even a paid for one) that would give somebody like me a base to start from and some idea how to carry on towards achievng this shape? Perhaps a list of must-have tools as well? So far I’ve got a sandbag, and that’s about it! I have to scrape myself off the floor when I see the prices of most of the tools, and can’t afford to just buy anything I see in hopes that it’s the right thing. It probably sounds stupid, but I’m so confused now about which hammers to use in which order, and which kind of stake – I was looking at this mushroom stake which is about the cheapest I have seen, (but still too expensive to get if it’s no use). I live in the UK and everything is twice the price it is in the US, although I have a realtive who can sometimes bring things back for me. I would really appreciate any help or advice you may feel able to offer before I give up in despair and go back to making flat pieces! Many thanks and kind regards, Loren Adams. I am trying to see if I can get time to do a step by step thing. My two best metal forming stakes are both handmade. One is made from a sanded and polished railroad spike. I will see what I can do in the next few weeks. Thanks for your reply – it would be just great if you could find the time to do the step by step thing. I have bought a 90mm ball stake for a reasonable price from ebid, and can get a smaller one if I have to – no real idea if it’s the right thing, but oh well, too late now! I honestly can’t see any prospect of me making my own stakes – I just don’t have the facilities or the skills. So any help or advice would be very much appreciated. Many thanks again. I am going to start on some bit of a tutorial this week. That would be great – thank you. Can’t wait!